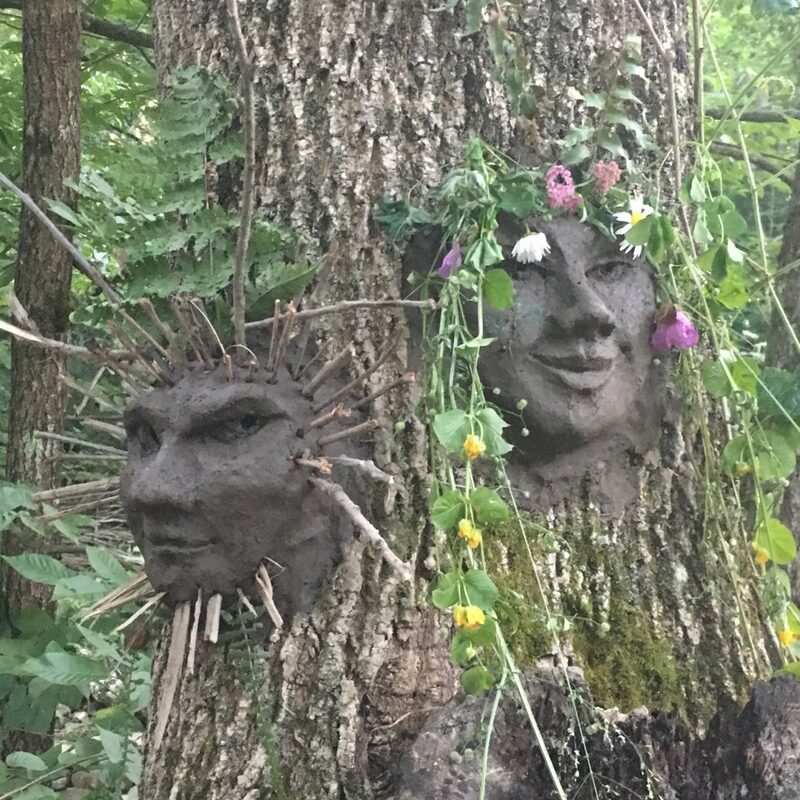 I have just returned from the land of the fae, a weekend of revels in Tatiana’s court, a Midsummer Faerie Festival. ( New York Faerie Festivalto be exact.) It is a wooded hideaway, a magical encampment, a respite from the world. It is a place where magic, equality, friendship, acceptance and joy are the rules of the day. 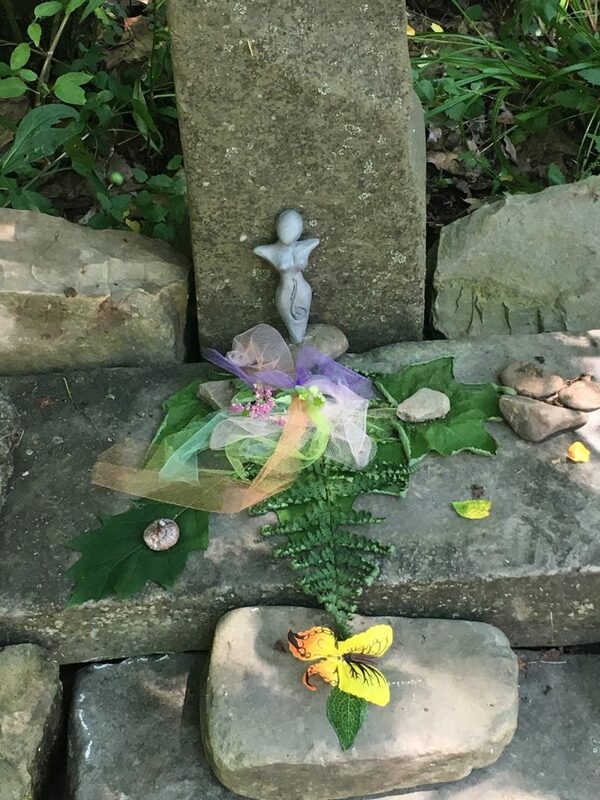 Last year I started a personal tradition: part installation, part art abandonment, part gifts for the faeries/nature spirits. I sculpt clay items, and leave them to be found, seen, enjoyed… and ultimately to weather and dissolve and return to the Earth. The festival site? The path from the front ate sloped uphill following a stream, through trees and glades, opening into circles and groves. 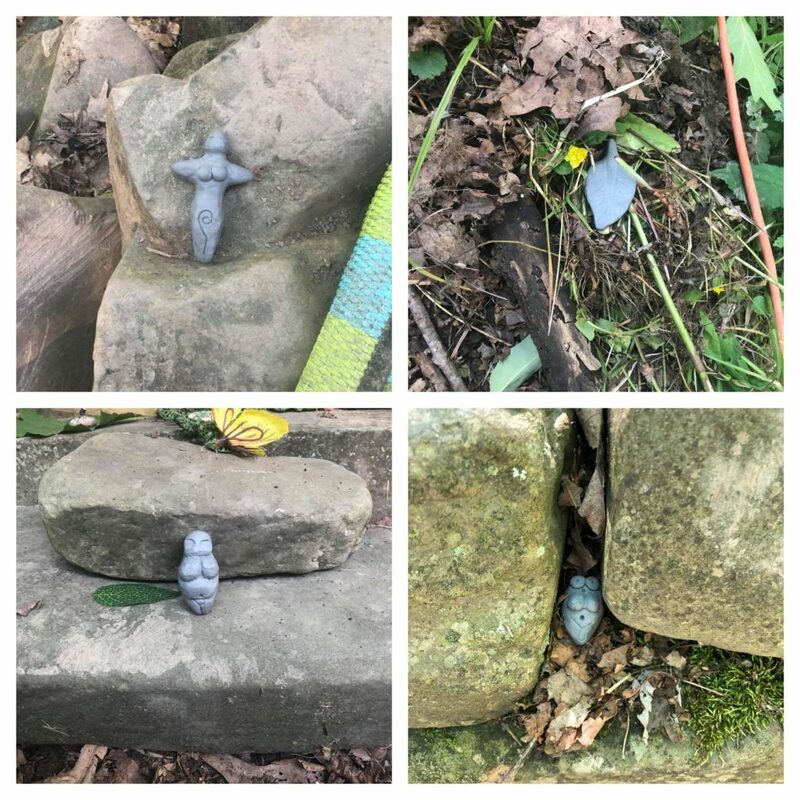 My friend and vendor neighbor Shane of Mythical Designs set up these stones a few years back – so we could decorate and make an altar of sorts. 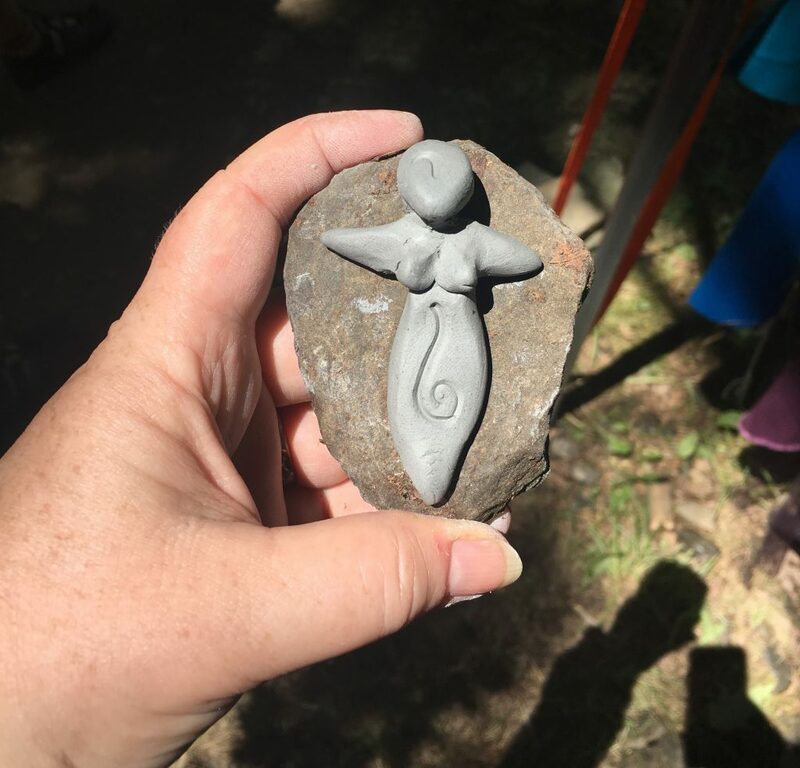 My first raw clay piece was a goddess figure to leave for Mother Nature. 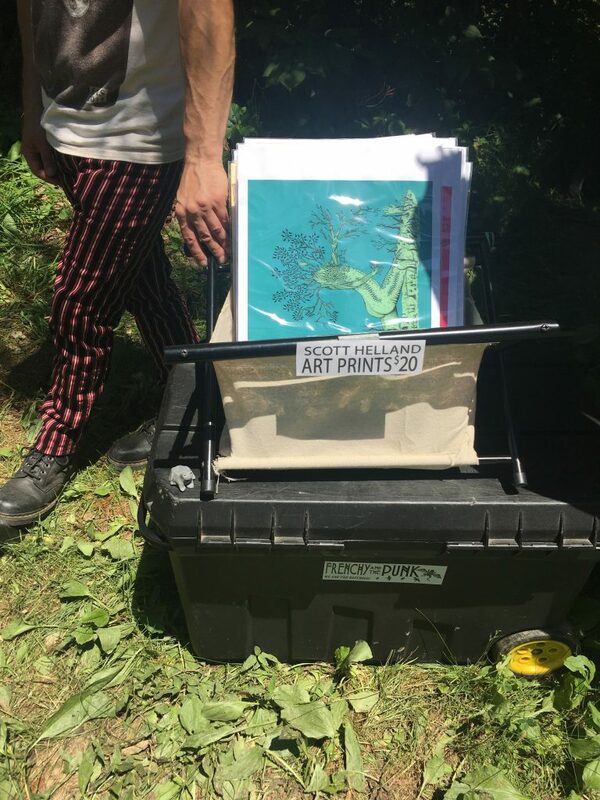 This past weekend of the festival was dangerously hot – is I did not make as many pieces as I had planned. 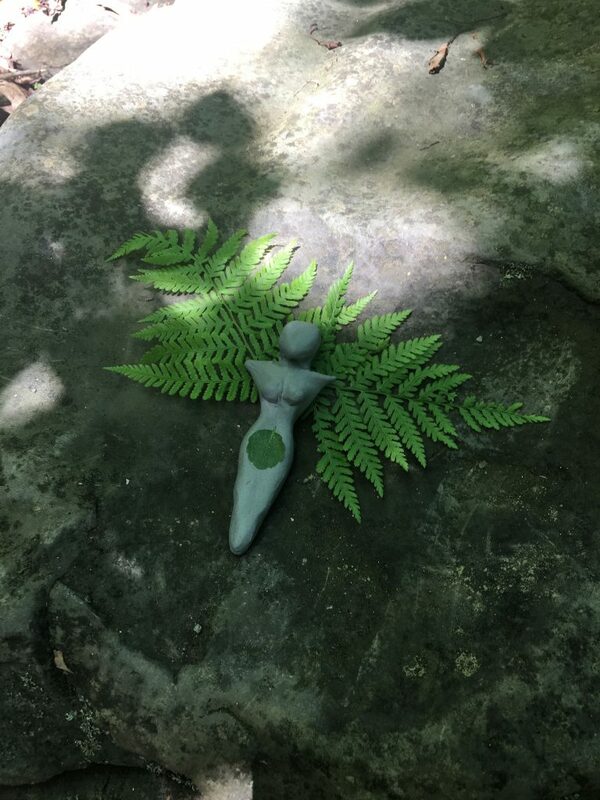 I like the keep them simple – like this fairy with fern wings. 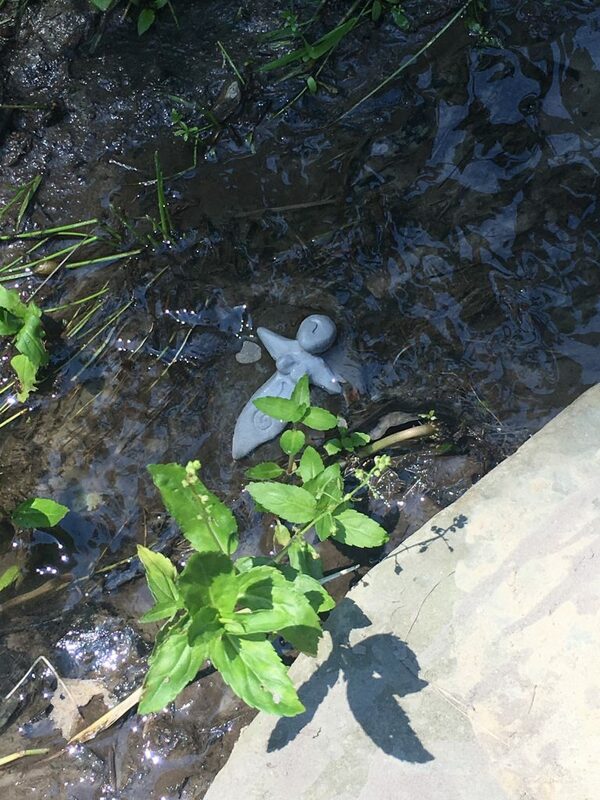 In addition to my “art abandonment” sculptures – the NYFF has a long history of mud Green Men sculpted on the trees. Initiated, I believe, by Shane with others contributing to the paces at times. These are the quintessential art installation! Using only mud from the street, plants and stones – it truly is magic taking form all around you. Shane starts a face, with pebble teeth. Although mud moves very differently than clay, potter/sculptor Kim Fritts was eager to get her hands dirty! 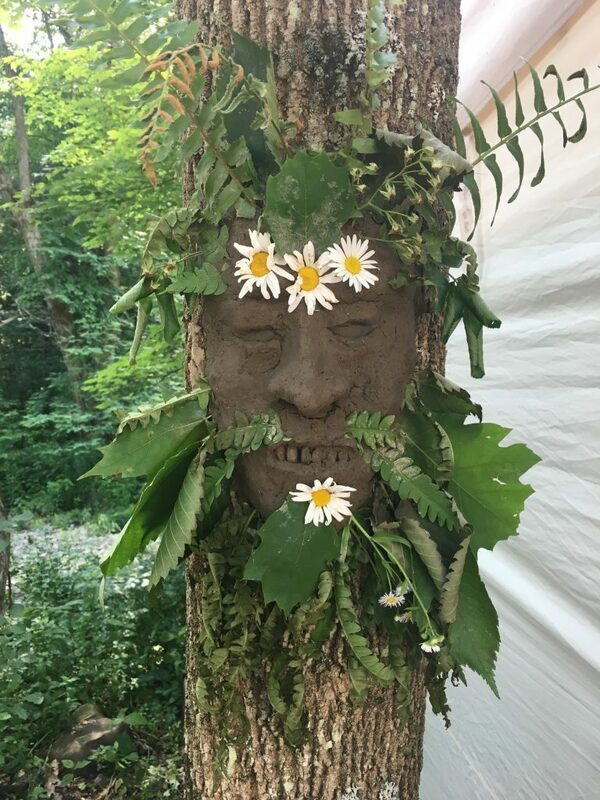 Dryad face? Mother Nature? Kim at work! Now I guess I need to return to the mundane world, of post festival laundry and getting ready for a show this weekend. But keep your eyes open! There is magic – and art – all around you. Stoneware for an earthy look, and coming soon porcelain for a more ethereal quality. Cut from slabs of clay – I drew a series of templates from vintage illustrations; my own childhood books. Carved and textured, drilled, awaiting the kiln… a moth to flame? Stoneware – waiting for stains and glazes. Sadly still a WIP. Terra cotta? Yes – for majolica style glazing. Headed to ^10 reduction for muted tones. With three shows in four weekends AND teaching every day – the moths haven’t been glazed and fired yet. I WILL have these soon, and for Beadfest if you are interested. In my precious down time this month – I beaded. And I had to bead insects! Vintage illustrations inspired the palette. Matte finish for contrast to the others. These three are all brooches, approximately 3: in wingspan. I plan to frame them in shadowbox frames so they are easy to display when not being worn. And I have to give a shout out to Caroline! Her moth pin was a gift – and started this flight of fancy! Please stop by the Art Elements team’s blogs – and our great guests this month! Pour a cold iced tea, and sit in the shade! Last month when I was doing some of the creative business entrepreneur journaling stuff – year in review and all – I relaized that I felt like I was in production mode all year in 2015. Not enough time to sculpt new designs, not enough time to play and develop new pieces. So when the ceramics studio re-opened this week, it was nice to get my hands back into clay. And it was nice to play a little bit. Celtic knot cabs are destined for The Bead Binge in Cherry Hill NJ. ( March 19 & 20). The larger rectangular pieces? Who knows? Mixed media pieces? Beaded into felted pieces? Tree of Life. Triquetras. Triple Spirals… and again some large I’m-not-sure-what-for-yet peices. But I look forward to glazing them! These are pressed from an antique cookie mold – you know the Springerle style of shortbread cookies? And this lovely lady… muse… goddess will go in the high fire reduction kiln next week. JUST IN TIME for the members show at The Palette and the Page next month! I have a few days to ponder what organic/sculptural elements will be included. She has a nature/woodland/plant theme. When Jennifer announced “fireflies” as the themed challenge over at Art Jewelry Elements – I knew the exact look I wanted to capture. The luminous deep blue sky, trees in silhouette, just enough light to see by… and the magical sparkles of light, like fairies flitting in the dusk. Now – of course I had another idea as well, and limited time between 2 shows this month and teaching Clay Camp at the “work” ceramics studio… Mason jars. The iconic symbol of childhood summer nights catching fireflies. These are still a WIP. I sculpted three jars of varying sizes from polymer, and made a quick mold. I cast them in resin, doing multiple pours, and embedding golden microbeads and flecks of gold leaf in the layers. (The gold leaf wins. The micro beads are too small.) The purple RTV had a more open surface texture, resulting in a frosted look that you can see on the left and center jars. The yellow molding putty – from ICE resin – had a much tighter surface, and yielded a better result. Still a bit cloudy/frosty, I plan to give these a quick surface coat of ICE resin to smooth out the inconsistencies in the surfaces and hopefully achieve a smooth/transparent/glossy surface. Please take a chance to see the other offerings from AJE team members and guests this month! Sure to light up some ideas for you! Bead Fest was two weeks ago?! Where has the time gone? Don’t answer that – I know: packing, unpacking, sorting. Sleeping, fondling beads, visiting with friends, art camp, field trips… More on the latter soon. So here are the hightlights, and the loot. 1. Bead Fest is social! Hanging out with Staci and Linda on Wednesday, the annual AJE dinner! So much fun! 2. Bead Fest is colorful and diverse. My display is for sure! I always bring a few tiles as they run parallel to my Mythic Nature pendants. Sold a few too! 3. Bead Fest is preparation – for me! So much to pack and remember for display, class, swaps… This was my class room still life from set up. Even though it was early Sunday morning – it went so well! And everyone had a great time, it seems. 4. Bead Fest is learning. Teaching. Creativity. Exploration. I was thrilled to teach at my first Bead Fest. I taught a mixed media class that incorporated quite a few techniques – that I am confident the students will apply in their work moving forwards. Here you see student work-in-progress, my concentration face, and class samples below. Matroska cabochons, raw glaze before firing. There will be pendants too. If you are a beader, wire worker, metal smith – or even a newbie bead stringer… please stop by and sat Hello! I will be at Booth 461 in Artisan’s Alley. Clay and linoleum – an unlikely duo? 2. Bisque firing what may be last load before Beadfest. 3. Mopping up basement as its a monsoon out there. 4. Waiting… to unload new goddesses from the ^10 reduction firing at the “work” studio! 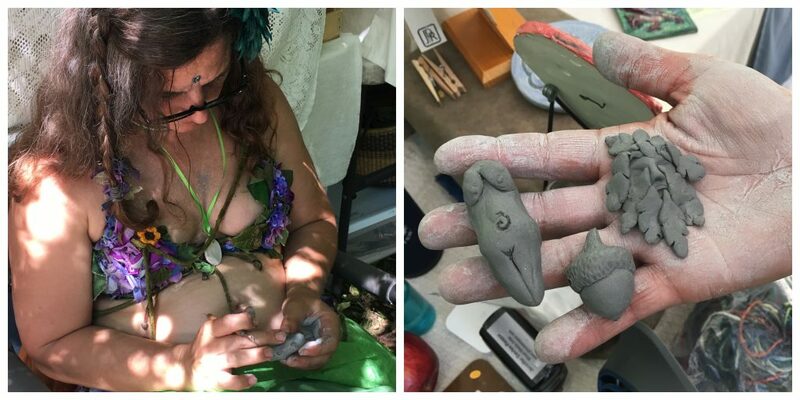 My friend, fellow clay artist and AJE member Diana P. wrote a post this week regarding her foray into carving stamps. She is working with EZ carve – similar in consistency to white erasers. Its great to carve, but a little springy. Too soft for what she wanted to do in clay, but great fun nontheless. So I decided to share some linoleum I had carved, and stamped into clay. This is the economy “battleship” linoleum that I used to use when I taught art/printmaking as a public school teacher. Its shallow but very firm and worked well for my new dseries of icons. Yin Yang and Om signs in clay – awaiting finishing. And one more example of linoleum and clay in tandem: this is a clay tile/print from a linoleum block I carved in San Diego. When I lived there I had an amazing artist/mentor in Sibyl Rubottom. This was from a printmaking and letterpress workshop I took at her studio, Bay Park Press. It was carved to print and accompany text set in letterpress. And so I tested it in clay – was thrilled the depth was sufficient to give me a print to glaze. This was the test piece; I plan to do more for my fall shows. Good morning! Its reveal time over at Art Jewelry Elements blog. This month we had a sweet porcelain rose from Diana! These might be a limited design – so check her shop now! Now – I saw this picture, and I decided to challenge myself a bit… and asked for lavendar. Nothing against pinks and pale purples – they just arent “me”. The bead I received was lovely… I went to my amethyst stash, logical. It was too boring. (The combo, not the amethyst!) I heard my sister Heather in my ear… lavendar green and yellow. Great combination… We window shop in boutiques on South Congress St in Austin and look, and discuss, have a coffee whenever we get a chance! It gives me insights into her tastes, and potential presents for her… So with Heather in mind, here goes. A double strand of gems: wire wrapped amethyst, yellow jade, jade… and tourmaline. The darn tourmaline was sooo tiny is was barely stringable, since I wasnt willing to go smaller than 24 ga wire. But it was essential to play off the glaze color as the amethyst was so dark. Finished with silk cord and a sterling hook clasp I whipped up. It hangs long-ish at 25″. I was working on it at a “Girl’s Beading Night” and have to thank Kim and Marsha – they advised on length, and Marsha had brought her silks… that helped decide the closure as she had the perfect green! I love the way it turned out, the colors are fresh and spring-like to me. The silk makes it super comfortable to wear – something I always consider. Thanks Diana for the beautiful piece in a rare (to me) color! Please take a gander at my colleagues creative interpretations of this focal – and the lucky monthly winners. That’s all for now… have 2 other posts in the works here for this week. I am trying to nurture my blog that gets so neglected when I am in the midst of teaching Clay Camp. 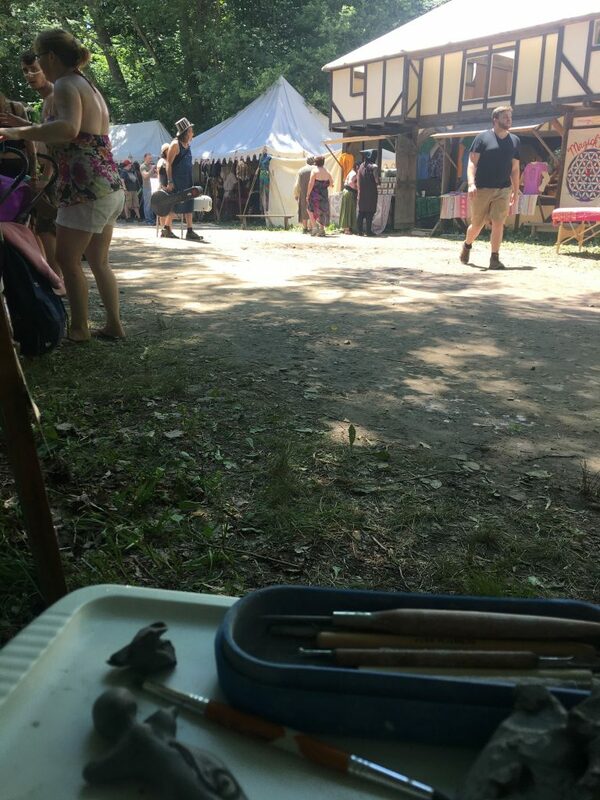 And I am in a Beadfest frenzy – so when I emerge from the “glaze cave” aka the basement studio, I can tap tap away here… Thanks for stopping by – hope to see you again soon. Well – its my primary focus for the next 5 weeks. I have up to 24 students in 2 age groups. Ages range from 6-17. They are with me for 2 weeks – one of creating, sculpting, wheel throwing, hand building; and another of finishing, glazing, decorating. Last Friday I did a post over at Art Jewelry Elements blog about the loading of the ^10 high fire reduction kiln. We unloaded today! It was a great firing. Not a ton of reduction – so out copper bearing glazes flashed more green then red. Simply beautiful in my opinion! The first thing I saw this morning! Taking it apart – shelf by shelf. Coffee is done. Headed to the studio. I’d love to hear what you think! Hello my Focus on Life photo/journey/challenge compatriots. I usually post on Instagram – altho I missed a few, and dont get to interact with you too much. I am usually teaching ceramics class every Saturday morning, and never seem to get a post written ahead of time… Please follow my pix on FB, and Instagram, and here – when I can. I spent last Sunday with a group of Stunners. Thats the Pre-Raphaelite term for their gorgeous ideal woman, their muse, that inhabit their paintings. I also spent time with real life beauties – my friends that accompanied me to the exhibit! It was a lovely day, hard to describe. The artwork touches a deep place in my heart and soul. It was wonderful to share the exhibit with like minded people. I ended the day feeling full, happy, sated, inspired, exhausted, euphoric…. Here are pix from that day – including my “Curve” themed shots. I think I take a picture like this every time I am at the National Gallery. It never ceases to enchant me. I will admit – I have not posted pix the last 2 weeks. “Wrapped up” and “Possibilities” So I submit this catch up photo – for both! I am deep into preparing for my first show, and I am all wrapped up in clay. The posssibilities are endless! Have a wonderful week everyone. I hope to see your pix out there on the Interwebs. Happy Spring!